Among the most popular loudspeakers developed by audio pioneer Paul W. Klipsch, the classic Klipschorn®, La Scala and Heresy were contributors in the birth of the high-fidelity era. Still manufactured and sold around the world today, these legendary Heritage Series products were recently relaunched in honor of the company’s 60th anniversary. While the Klipschorn features minor cosmetic and functional revisions, the La Scala II adopts a new finished appearance and the Heresy III offers increased performance through various content upgrades. The Heritage Series Heresy III three-way loudspeaker delivers an exceptionally "big" sound filled with the moving, emotional elements that make your music such an important part of your life. The efficient high frequency and midrange horn drivers as well as the reliable 12-inch bass woofer work together to create a very smooth, low distortion, dynamic sound. 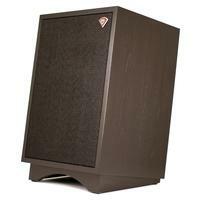 The Heresy III's sealed enclosure is available in a wide variety of rich wood finishes.